Irish Genre-Painter and Portrait Artist. Biography, Paintings. The Irish portrait and genre painter Leo Whelan was born in Dublin in 1892. He learned drawing and painting at the Metropolitan School of Art (now the National College of Art & Design), under William Orpen, becoming in due course (along with Sean Keating, Margaret Clarke and Patrick Tuohy) one of his most influential pupils in early twentieth century Irish painting, adhering strictly to Orpen's academic style of portrait art. In 1911, Whelan first showed at the Royal Hibernian Academy (RHA) with his portrait of O'Connell Redmond FRCSI. In total, Whelan showed nearly 250 paintings at the RHA, never missing a show between 1911 and 1956. 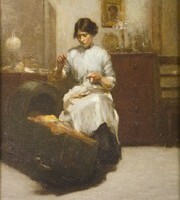 In 1916, as a student at the RHA art school, he won the Taylor Art Scholarship. A number of portrait commissions followed, including one of the IRA headquarters in 1922, featuring Michael Collins whom Whelan painted several times. In 1924, Leo Whelan was elected a full member of the RHA and became Visiting Teacher of painting and drawing at the RHA schools. When the Ulster Academy of Arts was born in 1930, Whelan became an honorary academician, exhibiting there on several occasions. Throughout the 1930s and 1940s, Whelan was much in demand and continued painting portraits with his usual meticulous clarity. He painted a wide range of people within the Church and the world of politics, including the Taoiseach John F Costello and Eamon de Valera. Whelan died in Dublin in 1956, aged 64. A master craftsman, most Whelan portraits have a meticulous finish as well as a sense of history. Typically, the sitters' hands play an important role in the overall composition. He usually portrayed women in specific interiors, with furniture, mirrors and other accessories. In contrast, his portraits of men are generally executed against neutral or curtained backgrounds, with perhaps only a single item like a clock or a fiddle as embellishment. Whelan's portraiture and genre painting is represented in collections throughout Ireland, including: Ulster Museum, Belfast; Crawford Municipal Gallery, Cork; Hugh Lane Gallery, Dublin; National Gallery of Ireland, Dublin; Limerick City Gallery of Art (includes National Collection of Contemporary Drawing); National Self-Portrait Collection, University of Limerick. His works also appear at London's National Portrait Gallery. A committed 'traditionalist', Leo Whelan remains one of the most beloved of Irish portrait artists and one of the best Irish genre painters.  For details of other traditional artists, see: Irish Artists: Paintings and Biographies.  For more about genre-painters like Leo Whelan, see: Irish Art Guide.  For more about traditionalist art, see: Homepage.